Executions In Iran Undergo 'Unprecedented Spike,' Amnesty Says : The Two-Way The rights advocacy group says it has credible reports that Iran executed at least 743 in 2014 and nearly as many so far this year, executing on average three people a day. 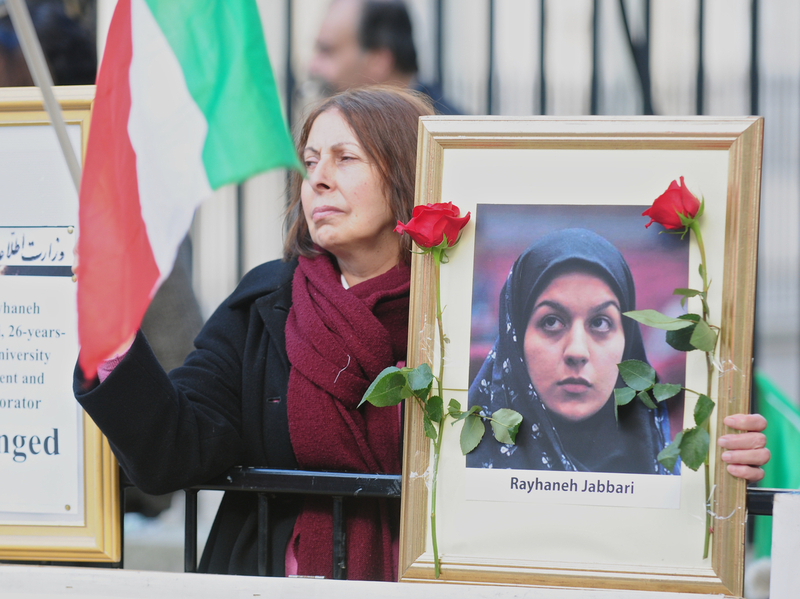 People gather opposite Downing Street during a protest against the execution of a young woman in Iran, in October of last year. Amnesty International says that Iran has undergone an "unprecedented spike" in executions in recent months. Amnesty International has identified what it says is an "unprecedented spike" in executions in Iran in recent months, writing in a new report that at least 743 people may have been put to death in 2014 and nearly 700 more since the beginning of the year. "Iran's staggering execution toll for the first half of this year paints a sinister picture of the machinery of the state carrying out premeditated, judicially-sanctioned killings on a mass scale," Said Boumedouha, deputy director of Amnesty International's Middle East and North Africa Program, was quoted in the report as saying. "If Iran's authorities maintain this horrifying execution rate we are likely to see more than 1,000 state-sanctioned deaths by the year's end," Boumedouha said. Amnesty International says that while it rejects the death penalty unconditionally, "death sentences in Iran are particularly disturbing because they are invariably imposed by courts that are completely lacking in independence and impartiality. They are imposed either for vaguely worded or overly broad offences, or acts that should not be criminalized at all, let alone attract the death penalty." The report comes as Iran continues to hold Washington Post journalist Jason Rezaian. Rezaian, who holds dual U.S.-Iranian citizenship, was arrested a year ago along with his wife, Yeganeh Salehi. Salehi was later released, but Rezaian was charged with espionage. He has had three closed-door hearings before Iran's Revolutionary Court.